In protest of the planned deportation of an illegalised Sudanese refugee we organise a demonstration to call for stopping this irresponsible and violent act. The man is part of the We Are Here group and his brothers and sisters of We Are Here are very worried what will happen to him upon arrival in Khartoum. We fear he will be detained and tortured. The Repatriation and Departure Service (DT&V) is planning to send this young man to Khartoum coming Tuesday May 16 at 12:50 with flight KL0565. Airline company KLM is facilitating this, what we call, crime. High courts have decided not to stop this deportation, we are now calling for pressure from society and politicians, to make this stop. Our brother is from the Nuba Mountains, this region is being bombed since 5 years and Nuba people face strong repression in Sudan. As a non-Arabic Sudanese the man will face extra danger. This is why we don’t publish his name. It is known that customs services and airport police see refugees who asked for asylum in another country as collaborators. People who arrive in Sudan with a emergency traveldocument and haven’t been in Sudan for a long time are seen to be suspicious. It is known that such persons are being detained, tortured and murdered. Human rights organisations such as Amnesty International, PAX and Human Rights Watch all declare that the human rights situation in Sudan is bad and that especially Nuba people are at risk when being deported. Forced deportations are dangerous and we see them as criminal acts. 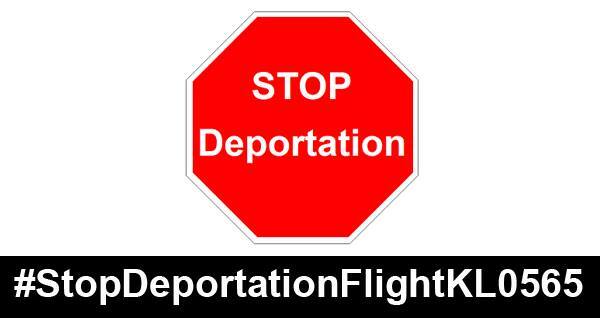 Stop deportation on flight KL0565 Tuesday! On Monday May 15th, We Are Here organizes, in collaboration with Nuba Mountains Solidarity Abroad and Darfur Union a demonstration to protest against the planned deportation of an illegalized, Sudanese refugee. The gathering starts at 11:30 am in front of the Ministry of Justice in The Hague. Dutch national airline KLM and the national Repatriation and Departure Service (DT&V) will use flight KL0565 on Tuesday May 16, at 00.50 pm to send the gentleman from Nuba Mountains back to the East African country. With this demonstration in The Hague the organisations call for the ending of deportations to Sudan and a re-evaluation of the Netherlands Immigration Service’s country policy that continuously underestimates the consequences of these deportations. To safeguard his privacy, his name isn’t mentioned in any of our releases. For the past five years, the Nuba Mountain region where the gentleman is from is being terrorized by bombings, oppressions and murders. As a non-Arab Sudanese he runs an extra high risk: Sudan’s national regime is dictated by Omar al-Bashir, the president who’s wanted by the International Criminal Court (ICC) in the Hague. There, he’s wanted for war crimes and the genocide of non-Arab Sudanese. In line with their government instructions, the Sudanese military police and secret services consider applications for political asylum a form of treason. This conclusion results in the detaining, torture and killing of those who applied for political asylum in Europe and arrive back on Sudanese soil. The planned deportation follows the rejection of the gentleman’s asylum application. Now that the European Court of Human Rights has rejected, without motivation, the request for an interim measure, there are no more legal grounds to prevent this deportation. The reasons offered to justify his return go against what human rights organisations like Amnesty International, Human Rights Watch and PAX write about the continuous violations of human rights in Sudan. In these statements the risk for Nuba who’re deported to Sudan is highlighted. With this protests that will happen both on- and offline, we want to prevent this deportation. Our aim is to prevent that the gentleman, who’s now in an asylum detention centre at Schiphol airport, will be brought to and arrive at Khartoum Airport at 02.05 am on Wednesday May 17th. During the demonstrations, the protesters will use the hashtag StopDeportationFlightKL0565 on Facebook and Twitter. The organisations invite everybody who can’t physically join the demonstrations to join the conversations on this hashtag if they want to/can contribute. Many Sudanese refugees who’re based in the Netherlands are members of Nuba Mountains Solidarity Abroad or Darfur Union. In solidarity with their Brother who’s currently in asylum detention but also out of fear for their own safety as illegalized people, they’re asking people for support. We, the undersigned, confirm that the deportation of the Sudanese activist (who is from Nuba Mountains of Sudan) poses a direct threat to his safety. First: The ruling regime in Sudan has a record of violations of human rights, it targets independent activists and antigovernment individuals who affiliates to different political parties. The Government of Sudan has also had a poor record of targeting and persecuting specific ethnic groups, collectively. The situation of the activist threatened with deportation applies to both cases. As in addition to being an activist at the individual level, he is from Nuba Mountains region where the citizens of that region are systematically oppressed and persecuted. Second: it is no coincidence that the head of the regime and a large number of his assistants are wanted by the International Criminal Court in The Hague. It is ironic that he is to be deported from a country where International Criminal Court (ICC) issued an arrest warrant against a president and be deported to the country of such president. Third: Reports from international organizations, such as Amnesty, confirm the deteriorating human rights situation in Sudan, which confirms that the activist will be at great risk if he is deported to Sudan. Fourth: Last year, the young Mohammed Ahmed was killed at Khartoum airport in mysterious circumstances. It is known that Mohammed Ahmed returned or was deported from Israel to Sudan. He passed away in the offices of the National Security and Intelligence Service (NISS) at the airport, and there was no investigation on the incident, which indicates that he was killed by members of NISS. Therefore, we urge the Dutch authorities to stop the deportation of the Sudanese activist, or otherwise bear full responsibility for all the harm he may be subjected to in case he is deported. We also appeal to Dutch civil society organizations, political parties, civil associations, and human rights organizations to move urgently to stop the deportation of the Sudanese activist. 1. Sudanese Democratic Forum in the Netherlands. 2. Union of the Peoples of Darfur in the Netherlands. 3. Organization of Sudanese Refugees in the Netherland. 4. Solidarity of the Peoples of Nuba Mountains in the Netherlands. 1. Parliament of the Netherlands. 4. Refugee Organization in the Netherlands (VWN).